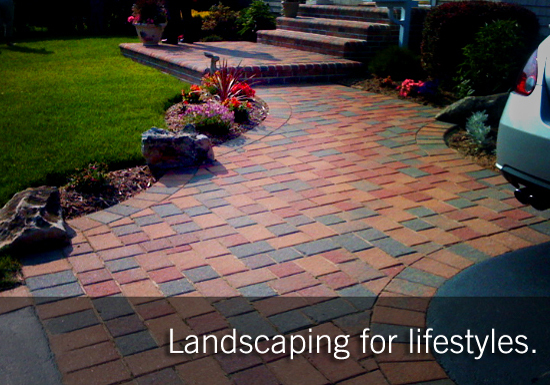 Lyon Landscaping offers a wide range of services to Suffolk County, NY. From patios, walkways, to retaining walls the design options are limitless. We often use brands such as Nicolock, Unilock, Cambridge and Evening Star to name a few. Very popular right now is the use of Evening Star round inset lights in brick or decking. Also popular are firepits that are both functional and used as a focal point, not to mention you can make some great toasted marshmellows! Lyon Landscaping can also assist you with irrigation. You may need a new system, or help with adjustments to your existing one to better water your trees, flowers and shrubs. We use only the best quality sprinkler equipment. Lyon Landscaping also offers regular maintenance such as lawn care, mowing, edging and more. Projects such as land clearing, land leveling are no problem and can be followed with grass seed or sod installation if requested. Often times a client may request a fence, arbor, or trellis installation. Lyon Landscaping can help determine where and how to install your product choices. Landscape architecture can create a very nice ‘backbone’ to your existing layout. The possibilities are endless, and you can feel confident with Lyon Landscaping. Our focus is to landscape according to your lifestyle needs!